6 week, 4 session/week (24 Total Training Sessions) plan with an emphasis on Strength and Work Capacity. Panther is the 5th and last plan in our “Big Cat” series of tactical Fire/Rescue Training Plans. Panther is a 4 day/week, 6-Week cycle, for 24x Sessions Total. 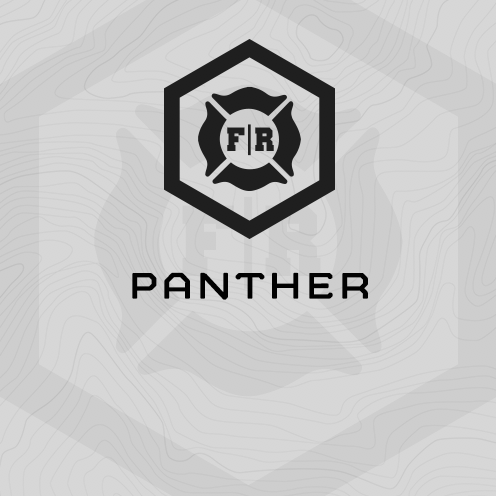 Panther deploys our most recent iteration of Fluid Periodization, and is a “balanced” cycle – training Strength, Work Capacity, TAC SEPA and Chassis Integrity in equal proportions across the cycle. Running and shuttle focused this cycle. Monday’s work capacity effort will be focused on a 1.5 mile running assessment and follow-on 800m repeats. Wednesday’s effort is built around 300m shuttles – you do these the first 3 weeks unloaded and the last 3 weeks in wearing your SCBA, 25# weight Vest or 25# back pack. Each is trained twice a week. - Athlete can rest in the bottom, hang position but can’t take his/her hands off the bar or step on a box/bench/ground. Be Strict! - no kipping or bucking. No warm up today by design. Go right to the 300m shuttles. The faster you finish your shuttle, the more rest you’ll get before the next round. Aim for 1:15 seconds or more rest per round. Use SESSION 2 assessment results to calculate today’s reps for the hand release push ups, pull ups and pull up bar heel taps. So, if you scored 15 pull ups at SESSION 2’s Assessment, today you’ll do 15 x .35 = 5.25 = 5 Pull Ups each round for Part (1).